Ann Sydow, in contrast, treasures the wolves whose numbers rose in Idaho but are now declining again. “Wolves are by far the most beneficial and the least dangerous of all the large predators,” she says, pointing out that there is far less animosity toward cougars and bears. A wide range of feelings about the wolf is standard here in Idaho, although both its detractors and its admirers agree that the gray wolf, Canis lupus, represents a remarkable success story in species recovery. By the 1930s, wolves had been almost completely eradicated in the West. Their U.S. recovery began when they were placed on the Endangered Species List in 1974, and it accelerated when wolves imported from Canada were reintroduced to Yellowstone and central Idaho in 1995 and 1996.. In the years since their reintroduction, wolves have multiplied and migrated into many areas of Idaho, Montana and Wyoming, more recently moving into Oregon and Washington as well. Their wide travel patterns and wariness of humans make them notoriously difficult to count, but Idaho Fish and Game (IFG) documents show a wolf population that peaked at 856 confirmed animals in 2009 and has since decreased to 683. Their advocates believe there were more than 1,000 wolves in Idaho, at least for a time. Wolves have reestablished themselves successfully throughout the Northern Rockies for several reasons. “They’re an elite predator,” said IFG Conservation Officer Matt Haag. “They can make food out of anything they want to.” Reintroduced wolves entered a habitat from which they had been absent for 70 years. The wild ungulates that remained – deer, moose and elk – had multiplied in their absence. Plenty of these game animals existed for the wolves to prey upon, as well as the domestic animals they had originally been eradicated to protect. Another reason for their success is their ability to spread out and procreate. “They can travel hundreds of miles to find a mate and establish a new pack and a new territory,” said IFG Habitat Biologist Brian Johnson. For years, scientists have been trapping wolves and outfitting them with radio collars for study. Johnson mentions one collared in Alberta that showed up in Colorado and another collared near Boise that was tracked to Saskatchewan. Given wolves’ tendencies to travel, it’s reasonable to think that some of the wolves introduced down south have intermingled with our locals. But the panhandle population of wolves has been growing on its own ever since wolves were placed on the Endangered Species List. According to Wayne Wakkinen, a wildlife biologist with IFG, management activities in the 1940s, ’50s and ’60s kept wolf numbers down. But as the effects of listing took hold, populations started to recover, and packs started to grow in the 1990s. Currently there are several documented and suspected packs in the panhandle. Closest to Sandpoint is the Keokee Pack, likely only a few animals that inhabit the area west and north of town. As the wolf population has recovered, pressure has mounted to remove wolves from the Endangered Species List. 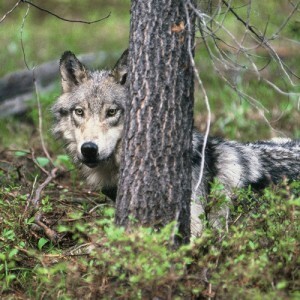 Over the protests of a coalition of environmental and wildlife groups, Idaho wolves were removed, then replaced through a court order, and then removed again most recently on May 5, 2011. The second removal particularly galled wolf advocates, because the delisting was made through a budget rider – a legislative maneuver that had nothing to do with the merits of the arguments on either side. “It was the first time that a political move removed an animal from the Endangered Species List,” said Sydow, who works with the wolf advocacy group Northern Idaho Wolf Alliance to get the wolves back on the list. 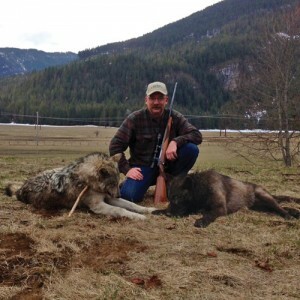 Wolf management in Idaho is now under the control of IFG, which is managing wolves as they do other big game animals. The state has agreed with the U.S. Fish & Wildlife Service to maintain a population of at least 150 individuals and 15 breeding pairs. But skepticism persists. Suzanne Stone, of Defenders of Wildlife, has been studying wolves for 25 years. Her organization is not opposed to the hunting of any species that can sustain itself, but she questions the difference between the state’s management of wolves and its management of other large predator species. Mountain lions and bears, she says, are managed to maintain much larger populations. “Far more pressure has been applied to wolves, in an effort to significantly reduce the wolf population. This is a big contrast between how the state of Idaho manages wolves and how they manage other species,” she said. Wakkinen and Haag both respond that a sustainable population of wolves is much smaller than that of bears or mountain lions. Black bears don’t give birth until they are four or five years old, and then they produce a pair of twins every other year. A mountain lion will have one or two kits every two years. In contrast, a female wolf, typically just the alpha female, starts reproducing by its second year and generates an average of four to five pups per litter every spring. Hunters’ concern is that wolves are decimating the elk population, and it’s true that this number, as measured by what IFG calls the calf/cow ratio, or the number of elk calves per 100 elk cows, has fallen in some areas in recent years. While the ratio has remained at a healthy 30 or so in the northern panhandle, it has dropped into the teens in parts of the St. Joe and Coeur d’Alene drainages, where Finney hunts. As a result, hunters there have seen a 90 percent drop in hunting opportunities. But wolves are only part of the issue for the elk in this region. A couple years of record snowfall recently have also depressed elk populations, as have habitat changes: Where the epic 1910 Fire cleared the landscape of trees a century ago, the brush that fills in first after a fire has supported increased elk populations for decades. Now, mature trees are starting to predominate again, and the preponderance of elk browse is dwindling. To support their efforts to regain protection for wolves, wolf advocacy groups are doing their best to prevent the problems with predation that led to the wolves’ eradication 70 years ago. Defenders of Wildlife is working with ranchers in the Wood River Valley of southern Idaho to develop practices that will lessen wolves’ attraction to their sheep, including the use of noisemakers, spotlights, night watchmen and “fladry” – flapping flags on strings like those at used car lots. Why fladry works is unknown, but it seems to keep the wolves wary and away from the herd, at least for a while. This work has been valuable not just because it protects the sheep. Tourists who come to the valley, which is home to Sun Valley Resort, want to see the wolves. With tourism as important as ranching to the local economy, reaching a sheep/wolf détente is important for everyone. To be fair, as with other controversies, the loudest and most strident voices get the most press but do not necessarily represent the majority of opinion holders. Despite their efforts to reduce the wolf population, ranchers and hunters agree that the wolves are never likely to go away completely. “Wolves are here to stay, there’s no doubt about it; it’s just a matter of trying to keep their numbers in balance with other animals,” said Coeur d’Alene hunter Rich Gerhard. And Compton, who was thrilled with his wolf encounter in the wild, nevertheless sees the necessity of a hunt: “I don’t know how they thought they could introduce them successfully and not have them managed by hunting,” he said. The target number of 150 wolves remains controversial. As Sydow pointed out: “The wolf was out of the picture for 70 years. All of a sudden it’s back, and people don’t know what’s going to happen.” The wolves are not coming back to the same Idaho they left: Old-growth trees have been cut in some areas; new growth has filled in others; and far more people live now in remote areas that overlap with wildlife habitat. Nevertheless, Wakkinen feels that resistance to hunting wolves may be dying down to a degree. “As we continue to have a harvest season on them and as we continue to show that wolves are at viable numbers throughout the state of Idaho, it takes the ammunition away,” he said. At some point, if the wolf population stabilizes, and if wolf advocates believe the population is big enough, and if ranchers and hunters feel that livestock are protected and game populations are adequate, wolves could come to be considered just another predator – albeit the elite one – in the wild landscape of northern Idaho. How much habitat do we have for wolves in northern Idaho? We’ve got about 7,800 square miles total in the five northern counties. We’d expect to find wolves in about 80 percent of that. Some portion of the area is large lakes, urban areas and agricultural land, but the vast majority is available to wolves. How many established packs and animals are here? The number of packs in the annual report isn’t an estimate or an actual number; it’s what we’ve been able to document. So that number is a minimum number of packs. Based on the report, we’ve got 17 packs that are wholly contained in the panhandle, that are here almost all the time. An additional 14 packs spend at least a portion of their time in the panhandle. They may all be here, or none of them may. So, if you figure half of those are here at any given time, there should be at least 24 packs in the five northern counties at any given time. Undoubtedly there are some others that haven’t been around long enough to be noticed or otherwise documented. The number of wolves in a pack changes daily, but last year, the average summer pack size was 8.3 in the region. About 10 to 15 percent of the wolf population is not associated with a pack, so a conservative estimate for last summer would be 160 to 290 wolves in the panhandle. Are wolves being reintroduced, or are they expanding here naturally? Prior to the first transplantation of wolves into Idaho, there were already about 50 wolves nearby, about 60 miles to the east of Sandpoint, and an unknown number to our north in British Columbia and Alberta. The U.S. 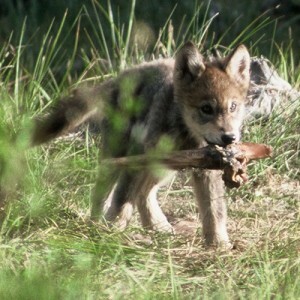 Fish & Wildlife transplanted about 35 wolves, but the nearest was introduced over 200 miles to the south. (Interestingly, the nearest source of the transplant stock – the wolves that were transplanted to Idaho – is only about 350 miles to our north.) So, the majority of the wolves in this area are likely walk-ins that expanded here naturally, but we assume the transplant did contribute to the wolf population in this area as well. And is the species the same as was found here historically? The wolf doesn’t lend itself to sub-speciation. The statement, “a wolf is a wolf is a wolf” is most accurate. What we have now is likely very much what we would have had without a transplant 200 miles to the south. At what rate are their numbers projected to expand? There are two different things going on here, and they’re moving in opposite directions. In terms of numbers of packs, 10 years ago we had two packs documented as denning in the panhandle, five years ago we had seven, and last year we had 20. So in terms of numbers of packs, they have increased in the panhandle and throughout Idaho. But the number of wolves has gone down because of hunting and trapping. The mean pack size is smaller than what it was before active management. Some of these packs are totally untouched, and others may be totally taken. How many wolves were harvested this year? There were 315 wolves harvested statewide during the past season compared to 377 a year ago. In the panhandle, the harvest of 71 wolves is about the same as a year ago (76). The lower harvest could be attributed to a variety of factors, including less interest in hunting and trapping this year, more wary wolves, fewer wolves, year-to-year fluctuations in weather conditions, and so forth. No doubt it’s some combination of all of the above. Are deer, elk and moose populations up or down, and how much is due to wolves? That’s the million-dollar question. What we look for is patterns. In Shoshone County near Avery, the elk population has gone down about 71 percent between 2006 and 2012. We have substantial concerns with moose as well, although probably fewer with white-tailed deer. In other areas farther west and adjacent to farmland, moose and elk populations are quite vibrant and increasing. When you add it all together, it may not look like much change is going on, but when you drill down a little to a smaller scale, some of the changes are huge. Is culling of those herds by wolves harmful, or does it make them healthier? Initially, if you have a herd without predation, you do have more old and sick animals. When wolves move into a system, that gets cleaned up pretty quickly. Then wolves choose from among healthy animals, and the result is just far fewer animals and only subtle differences between individuals. Certainly that’s been the case in the upper St. Joe and portions of the upper Coeur d’Alene rivers. How many conflicts with domestic animals have been recorded? There’s only one reported in the panhandle in 2012, and it’s usually less than five. People often don’t report dog/wolf conflicts. We don’t have a lot of livestock in this neck of the woods, so while conflicts here can be important, we haven’t yet seen a lot of this in the panhandle.